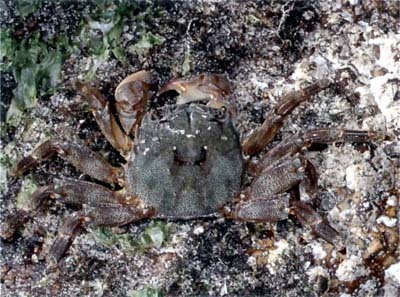 Shell smooth, shiny, lacks hairs; edges of carapace behind eyes have sharp spines; legs have single spine on top edge of major segment. To 30–40 mm across. In crevices and pools on exposed rocky shores (common at Point Lookout, on North Stradbroke I.). Eastern Qld; subtropical and tropical west and east Pacific Ocean.